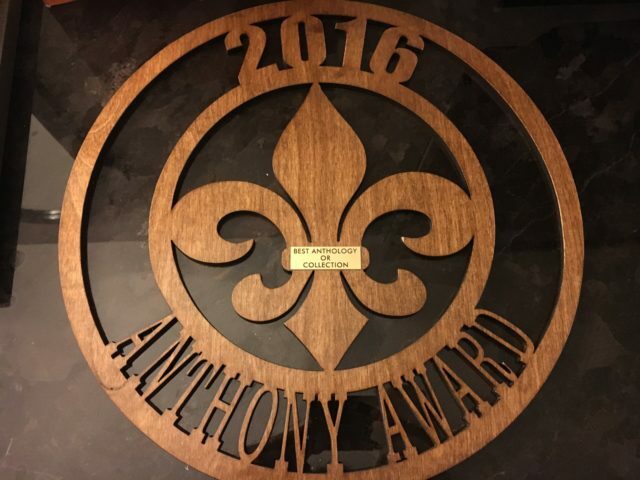 I’m back now from Bouchercon and thrilled that Murder Under the Oaks: Bouchercon Anthology 2015 won this year’s Anthony Award for Best Anthology or Collection—an honor I was proud to accept on behalf of the book’s 21 terrific contributors: J.L. Abramo, J.D. Allen, Lori Armstrong, Rob Brunet, P.A. De Voe, Sean Doolittle, Tom Franklin, Toni Goodyear, Kristin Kisska, Robert Lopresti, Robert Mangeot, Margaret Maron, Kathleen Mix, Britni Patterson, Karen Pullen, Ron Rash, Karen E. Salyer, Sarah Shaber, Zoë Sharp, B.K. Stevens, and Graham Wynd. The anthology, published by Down & Out Books, was my first turn as the editor of a collection, and the entire project stands out as one of my all-time favorite experiences. While the past year has certainly featured many memories, including the publication of my own first book, there’s a different kind of pleasure in spotlighting and celebrating the work of other writers—myriad pleasures, in fact, given the range of talents here: outstanding veteran authors including Margaret Maron and Tom Franklin, first-time writers including Kristin Kisska and Karen E. Salyer, and friends whose fiction I’ve long appreciated, including Robert Lopresti, Sarah Shaber, and B.K. Stevens. Gathering these and other writers together in this volume was simply a treat—a collection as diverse and dynamic as the range of authors. Our book launch and signing at the Raleigh Bouchercon was a thrill—a blast of enthusiasm from a standing-room-only crowd. And accepting the Anthony celebrating these stories was a great honor. Congratulations to all the contributors! And congratulations too to all the other distinguished finalists in this category: Thomas Pluck, editor of Protectors 2; Todd Robinson, editor of Thuglit Presents Cruel Yule; Kenneth Wishnia, editor of Jewish Noir; and especially Christopher Irvin, whose outstanding debut collection, Safe Inside the Violence, was the only single-author collection among the nominees, a tremendous achievement. While my own debut book, On the Road with Del & Louise, didn’t win either of the awards for which it had been nominated, I had great fun at the awards ceremonies throughout the weekend meeting and catching up with the other finalists: for the Macavity, Patricia Abbott’s Concrete Angel, Glen Erik Hamilton’s Past Crimes, Chris Holm’s The Killing Kind, David Joy’s Where All the Light Tends to Go, and Ausma Zehanat Khan’s The Unquiet Dead; and for the Anthony: Abbott’s Concrete Angel, Hamilton’s Past Crimes, Rob Hart’s New Yorked, and Brian Panowich’s Bull Mountain. And congrats to Glen Hamilton for bringing home both those awards! The full slate of winners for the Anthony can be found here and for the Macavity here. Additionally, the Barry Award winners are listed here, including Khan’s The Unquiet Dead for Best First Novel, and the Shamus Award winners here, including another Down & Out books author and Murder Under the Oaks contributor, J.L. Abramo, for Best Paperback. Being on the writing groups panel “Me and My Friends”—which included, well, me and my friends: Donna Andrews, Ellen Crosby, John Gilstrap, and Alan Orloff. We had a fun time on stage, and we were all pleased to hear through the weekend from folks in the audience who enjoyed, related to, and learned from some of the stories we told about our critiques and our companionship. Trying to keep track of the number of times someone called Alan Orloff by my name or me by Alan’s—which happened as well on the panel itself. Reading (on the flight down) a chunk of my good friend Paula Benson’s manuscript in progress, sharing some time with her in a mini-workshop on that excerpt, hearing about her plans for the rest of the book—which she must finish soon!—and then commemorating her birthday along with Bonnie and Dennis Stevens, Debra Goldstein, Riley Miller, and seven (yes, seven) desserts. Celebrating the release of Ellen Byron’s second novel, Body on the Bayou—and bonding once more with her and with two other of my fellow Agatha finalists: Cindy Brown and Julianne Holmes, whose encouragement and support I appreciate not just always but in very specific moments. Y’all’s kindness overwhelms. Bantering with the other finalists at the awards about which of the other nominees was going to win, since none of us expected that we would—proof of the camaraderie we all feel for one another. And just generally seeing—even if too briefly in some cases—so many friends, fellow writers, and fellow readers that I wish I’d had more time to chat with and wish I saw more often. Already looking forward to next year’s Bouchercon in Toronto—and on that note, another item for the list above: talking with Janet Costello and Helen Nelson about some plans there to celebrate Ellery Queen’s Mystery Magazine. I can hardly wait!